This installment of the Call to Arms-series clocks in at 35 pages, 1 page editorial/front cover, 1 page SRD, leaving us with a significant 33 pages of content, so let’s take a look! Once again, we begin the installment with aptly-written prose before being introduced to a brief history of the weapon in question, here firearms, and their impact upon warfare – with a caveat on how history obviously should not dictate the limits of your fantasy world. Still, I feel that this is as good a point as any to voice my complete and utter approval for these introductions: It is my firm belief that history and knowledge of such facts can prove to be exceedingly helpful when designing concise worlds and that knowledge gained is positive. Each and every player and GM sooner or later will have the experience, where an obscure tidbit of information learned from gaming as proven useful – I know I can list *A LOT* of such instances. A firm believer in the school of thought that we learn best while playing and doing what we enjoy, I welcome this school of design, harkening back to the details often featured in books of classic editions. So yes, kudos for these! But back to the present: In PFRPG, firearms suffer (yes, suffer!) from expensive pricing imposed by the mechanical benefits they convey. Now in an interesting way of codifying the prevalence of specific firearm types in a given world, we begin with a 5-tier, exceedingly easy to use pricing system that allows the GM to diversify the cost control of firearms. Rules such as these, which allow for precise GM-control, are welcome at my table and manage to account for campaign variation: In worlds with rare firearms, for example, a modifier of x 10 for the costs is applied, meaning that only the rich and powerful can afford these explosive toys. Conversely, if firearms are the prevalent weapons, a measly 10% price means that even bullets don’t hurt the purse as much at low levels. Speaking of variance and control – the pdf then goes on to provide optional rules, the first of which would be a lump array of “realistic” rules for firearms – but let me elaborate. First of all, crafting firearms via the broken mundane crafting rules is simply not feasible and takes FOREVER. Hence, the Craft (firearms) skill for player use herein: While not revising the time frame, at least the option is now there and the sample DCs as well as the advice which characters should get it as class skill can be considered to be neat. But back to firearms: If you’ve ever even fired a crossbow (or, if you’re American and/or have access to guns, a regular gun), you’ll note the distinct recoil and will never again take rule-of-cool action movies that serious. The recoil of early firearms was nothing to sneeze at, either, requiring bracing to deal with the more significant recoil. Indeed, there are quite a few guns herein that are balanced via this interesting mechanic – depending on the firearm and its caliber and type, subsequent shots may suffer from recoil penalties that make subsequent hits less likely. And no, you won’t have to retool weapons to use these recoil rules – only some of the big ones sport recoil rules – a more explicit mentioning of this fact may have been prudent, though it is not ambiguous. Bracing, a standard action, lessens these penalties, imposing an optional action tax upon the firearm’s wielder as a balancing mechanism for quite a few of the new firearms introduced herein. Now I mentioned historical facts – well, one undeniable fact is the simplicity of a firearm – compared to bows and other ranged weapons, firearms were easy to get a grip of: Thus, a trait and downtime retraining rules for firearm proficiency are provided, should you elect to simulate this behavior. Nice! Similarly, the phenomenon of main charges not igniting, flashes in the pan, is represented via an optional rule that diversifies the reloading – if you misfire by anything that’s not a natural 1, you just have a flash in the pan, which requires a move action to rectify (swift if you have Rapid Reload), taking a bit off the explosive heat of early firearms not belonging to the caplock firing mechanism. On the other side, if you wish to simulate rules for soot and the like clogging the firearm, the fouling optional rule can be found, penalizing shots and requiring the cleaning of e.g. muskets – failing to do this results in penalties, adding a form of agenda and tactics to the fray. And yes, magical maintenance is mentioned. Very interesting would be the Quick Loading option: It allows you to reload a 1-handed firearm as a move action, a 2-handed one as a standard action – faster with Rapid Reload. However, at the same time, the misfire rate of such quickly and sloppily reloaded guns is increased by +3. Conversely, having well-prepared material and carefully reloading may reduce the misfire rate by 1….which is interesting and adds an easy, tactical dimension to the firearm. Unlike modern firearms, early firearms did not adhere to the spray and pray/point and shoot-principles, but rather required quite a few steps – which, realistically, results in issues regarding the precise use of readied firearms – again, represented via a sensible houserule that takes different firing mechanisms into account. Similarly, there would be the one historic component that made firearms so effective in its infancy – not the capability to kill, but rather the effect they had: Spooking mounts and superstitious or craven foes as well as the clouding effects of blackpowder smoke receive a proper mechanical representation you can take or leave, as you wish. Now I already mentioned differences in triggering mechanisms tangentially, but not the extent in which this book codifies them: In a long overdue manner, we receive a loading time progression table as well as a significant array of different triggering mechanisms – including rules for slow matches, matchlocks, wheellocks etc. – basically, you have the tools for truly diverse firearms at your beck and call here and if you’re like me and a bit neurotic regarding the different components, then this will make you grin from ear to ear. Now while the above, highly modular firearm rules in conjunction with the triggers makes for a truly diverse array of customization options that make the balancing of the new material interesting…innovative even. The respective weapons introduced similarly are rather creative – providing e.g. rules for muskets used as clubs, knife bayonets and stackable weapon modifications like bayonets etc. – and e.g. the double flintlock punching dagger. 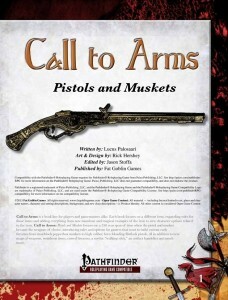 From dueling pistols to wall-gun muskets and repeating pistols and muskets, this pdf features a diverse array of new weaponry, some of which even gets art from Rick Hershey. Beyond the weaponry, rules for alchemical silver bullets or those crafted from cold iron or coin gold, minie balls and riffled bullets further enhance a given game’s details and believability as well as the options available. Similarly, from powder flask to lighters and casting tools as well as percussion caps, the tools of the trade are provided in detail. Kudos indeed! The book also sports 4 new magic special weapon abilities, spanning the range from +1 to the armor-piercing +4 enchantment, allowing for multi-barreled weapons to duplicate ammunition loaded into the primary barrel for the weapon – alas, the enchantment only specifies that it automatically loads, not whether the secondary barrels require the ammo or whether this ammo pops up – in the latter case, we have a problem, for it would allow for the infinite reproduction of bullets. Clarification is required here and the ricocheting enchantment uses range increments to determine the number of ricochets…which is interesting, but stronger than I’d have priced at +2. -something I’d also extend to the bouncing bullet. Other than that – well, interesting. Speaking of which, elemental themed gemshots allow you to literally blow up huge amounts of gold in smoke, but also provide a huge table of lethal damage dice – for 18K, you can make a 30d6 bullet…which is a bit problematic – the last 4 steps of damage dice progression each sport +5 dice, which is a lot and imho, too much. Then again, you spend a vast array of your wealth on these killer-shots…but still. I’d suggest any GM introducing the most expensive of these to take the utmost care. We also receive 7 specific magic firearms, which range from a magical, ten-barrel volley gun, a high-powered windbüchse, a legendary elysian hunter’s musket or the legendary Lawbringer, crafted by the axiomites to never misfire as well as allowing for the geas of agreements – the spell here being btw. not properly italicized, though the formatting of weapon qualities and spells has improved significantly over the installment on axes and picks – kudos! We even get a merciful firearm for the truly good and three variants of firearm-proof armor. There is a level of sense prevalent throughout the chapter on magic – in a world where magic and guns both exist, an everburning slow match makes sense; similarly, rods to make firearms weaker are part of the deal here and gunpowder that does not become useless when exposed to water or dampness. Like the previous installment, we are introduced to a new mythic item as well, a musket mace based on Henry VIII’s notorious, presumed safeguard while going incognito – nice to see this real world legend being represented and acknowledged by the pdf! An artifact bandolier provides further narrative potential with the various weapons you can draw forth from it. If you’re like me and expect the gunslinger to receive information regarding the use of the optional rules…then you’d be in luck, for the pdf does provide this as well. Furthermore, we get the Cuirassier cavalier archetype, who replaces the charge abilities with caracole tactics that center on firearm use while in the saddle as well as a truly devastating capstone. On a cosmetic side, I think I would have preferred the archetype to split the ability caracole by the levels, parallel to the charge abilities, but ultimately, this is a more or less cosmetic complaint. Editing and formatting, while not yet perfect, show already signs of the new and increased quality standard of Fat Goblin Games at that time – the book is pretty well-edited and the hiccups I found are few and far in between. Layout adheres to Fat Goblin Games full-color two-column standard for the series and the pdf sports nice full color artworks by master Hershey. On the downside, this book does suffer from a lack of bookmarks, which is a significant comfort detriment. Beyond the formal properties, the massive level of growth exhibited by author Lucus Palosaari herein deserves mention – if I didn’t know better, I’d assume another author behind this tome, particularly when compared to the previous installment. While there are some problematic aspects herein I do not consider superb (high level gemshots…), this book still more or less revolutionizes how you can use firearms. For one, this is simulationalist’s dream when working within the PFRPG system with firearms; more importantly, this book takes a thoroughly modular approach towards the subject matter, allowing for precise control and introducing exceedingly scavenge-worthy balance-mechanisms that can make firearms work in just about every context. So yes, there is a lot to love within this book. At the same time, there are quite a few components in the book that are simply less interesting – one cursed weapon is the definition of bland filler; the cavalier archetype isn’t that great (where’s the better withdraw/powder-smoke trickery?) and could have used some more signature tricks beyond “Good at riding and shooting foes.” Still, this would not be enough to drag the pdf down by a whole star. In conjunction with the missing bookmarks, though, I cannot go higher than 4 stars on this one – but it still should be considered a more than worthwhile little book that can even be considered to be a must-have addition for firearm-heavy campaigns.